In an epic collision of this year's two biggest Washington storylines — both precipitated by Russian meddling in the election — special counsel Bob Mueller is expected to bring his first indictment today, and Big Tech (Facebook, Google and Twitter) gets grilled on the Hill tomorrow and Wednesday. 51% (including 49% of independents) think the Russian allegations against the Trump campaign are a serious issue. 54% (including 50% of independents) take seriously the allegations that Russia used social platforms to deliver targeted advertising. 51% say social media does more to harm than help democracy and free speech. By a 2-to-1 ratio, Americans say technology will likely take away more jobs than it creates over the next 10 years. Just 18% of Americans say the amount of data in tech's hands is a good thing, yielding better products and services. 78% see it as a bad thing because of potential misuse. But, but, but ... People have strongly favorable views of the biggest tech brands, and don't trust the government to properly regulate the tech companies — partly because of the fear of overreach. That's a sobering backdrop for potentially the most consequential week since Trump was inaugurated nine months ago. Why this week matters: After months of spin and bile, we'll finally see the tangible impact of Russia's meddling in 2016. The special counsel's first move could lead to pardons or Mueller's firing, igniting a debate over executive authority. The tech companies' testimony opens an equally potent battle to define the boundaries of free speech and press freedom in the Internet era. We'll see a new struggle over the balance of power between Congress and the Executive Branch, and the beginning of the fight to constrain the economic and social power of the Internet titans. Be smart: This week may only deepen our partisan trench warfare — more impeachment calls from the left, and more outrage about the "Hillary dossier" from the right. We'll see that the Russia issue isn't some subplot. It's multifaceted and ongoing, and will require a response from every element of public life. 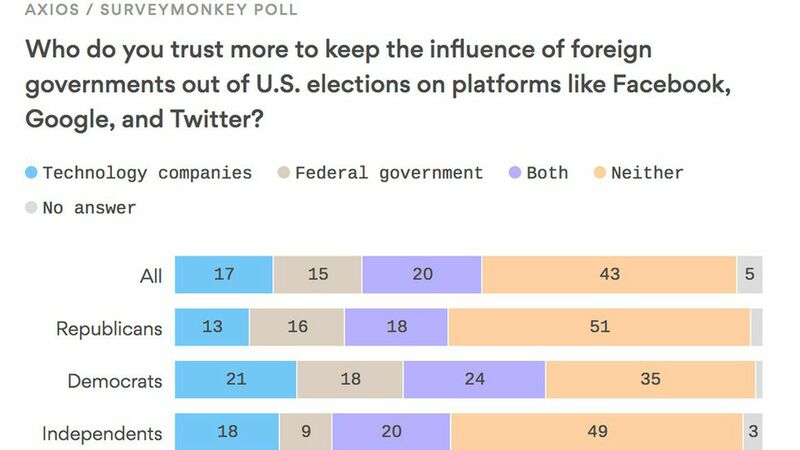 Go deeper: "Americans don't trust tech firms or feds to police Russian meddling in U.S. politics," by Axios tech editor Kim Hart ... "Americans worried about Russian influence on election," by David McCabe. The NFL's Houston Texans kneel and stand during the singing of the national anthem in Seattle yesterday. All but 10 members of the team took a knee to protest owner Bob McNair, who was quoted as saying during an NFL owners' meeting about player protests: "We can't have the inmates running the prison." McNair has issued two apologies. "Trump said in a video released Friday he had 'somebody very specific in mind' ... and would announce his decision 'sometime next week.'" "Powell would take the helm of the central bank in early February, when Chairwoman Janet Yellen's four-year term expires." "Powell, a Republican who served as a Treasury Department official in the George H.W. Bush administration, joined the Fed board in 2012 and was confirmed for a full term in 2014." My nephew Anders texted me an animated dog — an Animoji, from the same family as the alien you see above — that said, in the 19-year-old's voice and with his facial tilt: "Hey, Uncle Mike, it's me!" Anders, a college freshman, is our family's designated early adopter (he followed 4G blogs long before the fast broadband rolled out nationally), and a longtime Apple connoisseur. Ina Fried, Axios chief tech correspondent, will have our official review soon. But I asked Anders to play with the iPhone to see what he liked and didn't. Then he showed me how to use the new features packed into the 10th anniversary edition of the device that put palm-sized supercomputers in our pockets. Why it matters: The iPhone X screen (as you can see in the left-hand image below), stretches edge to stainless-steel edge, like an infinity pool — "all display," as Apple puts it, a "physical object that disappears into the experience." And the social networks want to replace TV, with us as the stars and producers. This phone's capabilities — with easily created and shared TrueDepth images that are crisp, yet imbued with more of life's subtlety — will speed up that process. Once again, the miraculous instantly becomes the norm. Apple says this phone will set "the path for technology for the next decade." Bet it'll be a fast 10 years. Anders' first observation was that the phone is smaller than his top-of-the-line iPhone 7 Plus, but with a bigger screen (5.8‑inch Super Retina display). He could easily do everything in one palm; reaching top to bottom on his current phone is a stretch. Part of the reason for the bigger screen is that there's no home button for navigation — you do it by swiping. The X has fancy glass on both sides, though you're crazy if you don't hide the back with a protective cover. Instead of a passcode, you can unlock the X with Face ID that you set (see right-hand image below) by rolling your head in circles till the camera "gets" you from all angles. It can take a few tries to set up. But then it works reliably, even in the dark. As you grow a beard, it keeps learning and recognizing you. For selfies, you can carousel among Natural Light, Stage Light, Contour Light ("dramatic shadows"), etc. — and see the effect before picking one. Some features just catch up to other brands, including the wireless charging dock where you lay the phone. What's next: Anders' biggest question was why Animojis can turn you into a robot (center pic below) or monkey, but you can't send your own face — even though the phone captures you for the unlock feature. Apple treads carefully around privacy issues. So I'd look for that capability in the future. Be smart: Not everyone can or should upgrade to this cool, unnecessary technology. But it's a taste of the future, when the way we communicate electronically will be even more seamless with — and similar to — interacting in person. Soon enough, it won't be a talking dog popping up to say "Hey." It'll be Anders. The Trump administration is fumbling its attempts to repeal President Obama's methane emissions limits, Axios' Amy Harder writes in her weekly "Harder Line" energy column. The oil and natural gas industry is, in turn, scrambling to respond to the resulting regulatory vacuum. Why it matters: These efforts to roll back Obama's methane rules offer a glimpse into how President Trump's deregulatory agenda is stoking industry uncertainty, and how the debate over climate change is influencing oil and gas companies operating in the United States. Roger Stone — the flamboyant on-again, off-again, Trump adviser — had his Twitter account locked this weekend after savage attacks, by name, on CNN personalities following the network's scoop on Friday that Mueller had his first indictment ready. Stone texts me: "I was told by Twitter that [I] would be suspended for 3 hours. I was told the suspension was temporary. At the end of this time-out period my Twitter feed remains suspended without explanation. I have never been informed formally by Twitter that I am permanently banned." "Since no one tweet is that important I am prepared to delete those deemed to violate their guidelines but they have never told me which those are." "I hope they will reconsider. I am prepared to litigate which could have as a result [their] being regulated like a utility (the phone company cannot deny you a phone) Several Deep pocketed entities have offered to fund such a lawsuit. I hope it is unnecessary." Twitter tells me that it doesn't comment on individual accounts, but pointed to "Abusive Behavior" language in its policies: "Harassment: You may not incite or engage in the targeted abuse or harassment of others." "The drug works by mimicking the effect of endurance exercise on one particular gene ... By binding itself to the receptor for this gene, [the drug] reconfigures it in a way that alters the messages the gene sends — boosting the signal to break down and burn fat." But, but, but ... "I called Tim Willson, the drug's designer, to ask whether he would take it. 'No,' he said, without hesitation. I contacted the other researchers and found that none of them had ever taken an exercise pill, in any form."